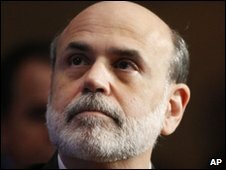 The Federal Reserve made a profit of $52.1bn (£32.2bn) in 2009, a rise of 47% over the previous year. The sum allowed the central bank to pay a record $46.1bn to the US Treasury last year. That was the largest amount ever paid by the central bank since its creation in 1914. The record figure was largely thanks to its attempts to support the financial system throughout the ongoing financial crisis. The Fed funds itself from its own operations and returns any profits to the Treasury department. The figures suggest that US taxpayers have, so far, gained money from the US government's action in propping up the system. Some of the profit has come from interest earned on government bonds and mortgage-related securities - including those of mortgage giants Fannie Mae and Freddie Mac. The emergency lending programmes instituted by the central bank during the last year's financial crisis helped swell the Fed's balance sheet to more than $2tn. They were designed to keep down interest rates and get banks lending to each other again, hoping to spark an economic recovery. The Fed could also lose money on its holdings if it sells them at a time when they have fallen in value. The Fed also earned money from its emergency loans to banks and other firms, such as the giant carmakers. It charged both interest and fees on these.